Pub Quiz every Tuesday starts at 7pm. Located in the heart of downtown, this chic, two-story San Jose restaurant has it all. With upstairs and downstairs dining rooms, two exquisite granite-top bars and a beautiful rooftop garden patio, the Loft is fast becoming the hipster spot to begin or end a night out in San Jose. The menu consists of unique and familiar dishes such as Panko Crusted Chicken Breast, Scampi Prawns and Braised Lamb Shanks. Ingredients range from mint-rosemary port wine sauce and papaya-jicama salsa to whole-grain mustard demi glace and tarragon aioli. With several catering options available in the Silicon Valley, Catering Service by Loft Bar and Bistro is like bringing a downtown restaurant to your house! With a wonderful selection of family favorites like Fried Calamari and Short Ribs to unique delectables like Steak Bites and Shaved Tri Tip, the cuisine Loft Bar and Bistro can deliver will make any catered event a hit. 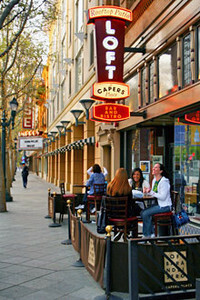 The Loft is one of the most comfortable banquet facilities in Downtown San Jose serving great American cuisine. For large private events, the Loft allows groups to reserve the entire restaurant. With two full service bars, a gorgeous roof-top patio and spacious dining room, the Loft Bar and Bistro is ready to wine and dine friends, family and business partners for any occasion. Call today for reservations and availability.